Congress Plaza Hotel. Photo credit: IvoShandor. Zombies, werewolves and vampires might be filling the movie lots and soundstages of Hollywood. But guess just what type of "guests" are checking in—and not checking out—of one of Chicago's most prestigious places? The 871 guest rooms and suites of The Congress Plaza Hotel are notable for providing posh accommodations—and incredible views—for visitors to Chicago. 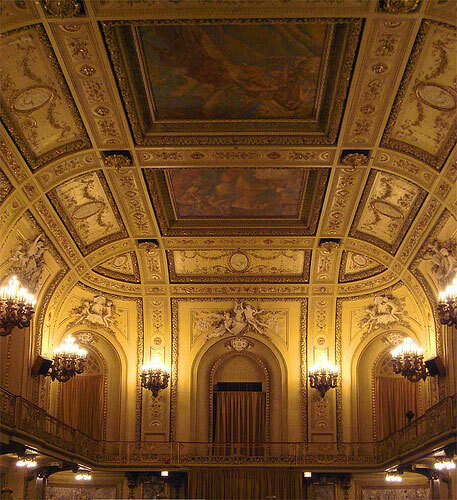 But, over the years, it has also become known as the most haunted hotel on Michigan Avenue, and maybe even the most haunted space in all of the Windy City. It wasn't always that way. This "Landmark of Chicago Hospitality" was originally built over a hundred years ago to accommodate visitors coming for The Chicago World's Fair. 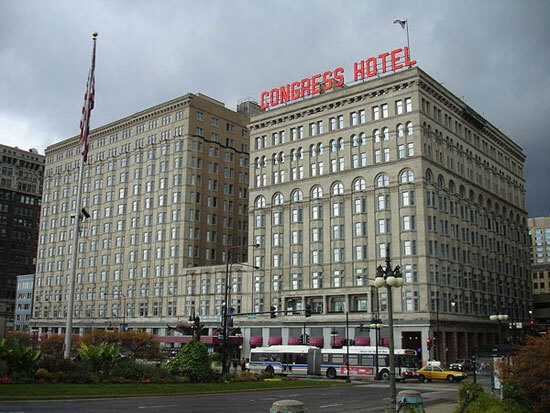 The hotel didn't actually become The Congress Plaza until 1908. That was about twenty years before one of its most notable (and notorious) residents, gangster Al Capone, was said to have lived here; some reports are that he owned the hotel for a while and used it for his headquarters. Truth is, Big Al never actually stayed here, at least not under his name. But residents still see him from time to time, walking these hallowed halls with the rat-ta-tat of his two-tone wingtips. Other less notorious but just as notable names haunting these halls include the homeless hobo, "Peg Leg Johnny," who was said to have been murdered in the hotel many years ago. Then there's the workman who supposedly got buried behind the walls when the hotel was being built, but who is now just referred to as the "hand of mystery," referring to his gloved hand that supposedly sticks out of a wall in the closets behind the balcony in the Gold Room (what is up with all the displaced body parts floating around this hotel?). And speaking of the Gold Room, it's rumored that some of the bridesmaids in wedding parties who gather around the piano for photographs do not actually show up in the pictures. The beautiful Gold Room. Photo credit: bcworks. As for others, legend has it that a lone man roams the eighth floor, where the elevator is said to stop frequently, even though no one has pushed a button. And "voices" are heard in ballrooms even though no one is there. Don't book room number 441 if you plan to stay at the Congress; security is called there than any other room. Guests report seeing the same thing: the shadowy outline of a woman. But the biggest scare is saved for the 12th floor, where there is said to be a room so frightening that the door was fastened shut from the outside. But it's not all about ghosts at The Congress Plaza. The hotel has also played host to presidents, celebrities, performers and foreign dignitaries. But, it seems, the more ghostly apparitions are the ones that people come to see—or not see. As for things hotel guests can actually see, the Congress Plaza Hotel has plenty to offer just by stepping outside its front doors. The 14-story property (or maybe 15-story, as another mysterious rumor suggests a hidden, closed off 15th floor) is located in the heart of the city and is just a few feet from nearby classic Chicago attractions and things to do such as the Art Institute of Chicago, Shedd Aquarium, Adler Planetarium and the Field Museum, which are all included in your Chicago CityPASS, and, by the way, are not anywhere near as haunted as the Congress Plaza Hotel.